Whatever you think of Kim Kardashian and how she rose to fame, there’s undeniable fact about her family: they get money. Although it’s easy to get fooled by their plastic surgery, vocal fry, and reality show antics, the Kardashian conglomeration makes bank, so if you’re able to do business with them, there’s a good chance turn a profit. Well, it wasn’t to potential employers at least. They must’ve gotten a huge kick out of the mention of Mama Kim, which nailed him three job interviews in under a week. He’ll have to update his resume to mention he was retweeted by Kim K., not once, but twice. Oh wait, he already did. That’s what I call a big boss move. If I were him, I’d up the ante on my job search and hit up even bigger fish. A look at his experience is pretty legit already, though, and it seems like he’s already making the right moves. People were quick to remind us that, while Kim’s retweets are definitely valuable, his other experience is great, too. Credits at BET and FOX aren’t anything to sneeze at, and the man clearly knows how to get attention, which isn’t an easy task on social media. Chris isn’t the first person, nor will he be the last, to think outside the box when creating an awesome resume. Let us not forget Lukas, who thought of the absolute sweetest way to make sure potential employers saw his resume. 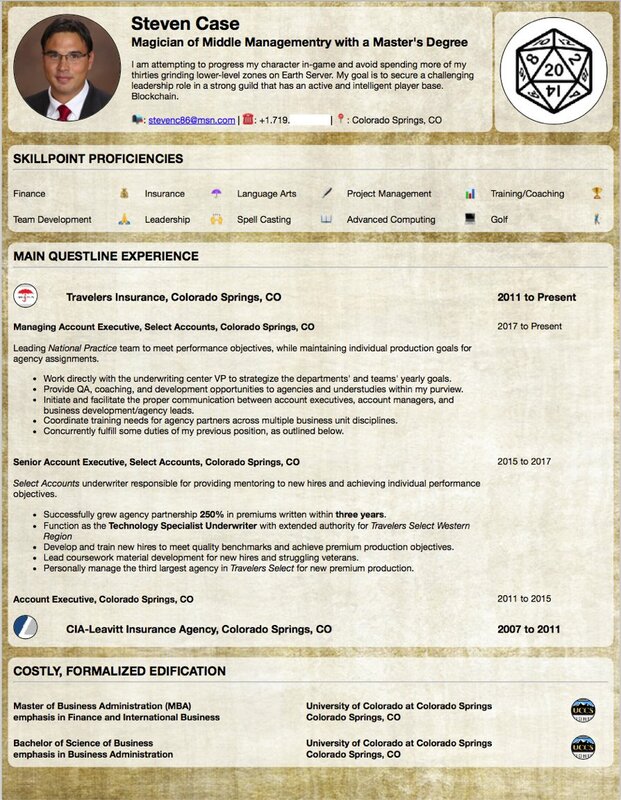 The brother of a guy named Steven Case made him a resume in the style of Dungeons & Dragons, and it’s about as nerdy as you would expect. Seriously, just look at this thing and it seems like it was ripped straight out of a dungeon master’s guidebook. Steven told his bro that the CV basically made him appear “unhireable,” but a lot of people online disagreed. But maybe that’s because I’m a sucker for a nerdy reference, and there are some people who use undeniably “cooler” source materials for inspiration behind their non-traditional resumes and cover letters. 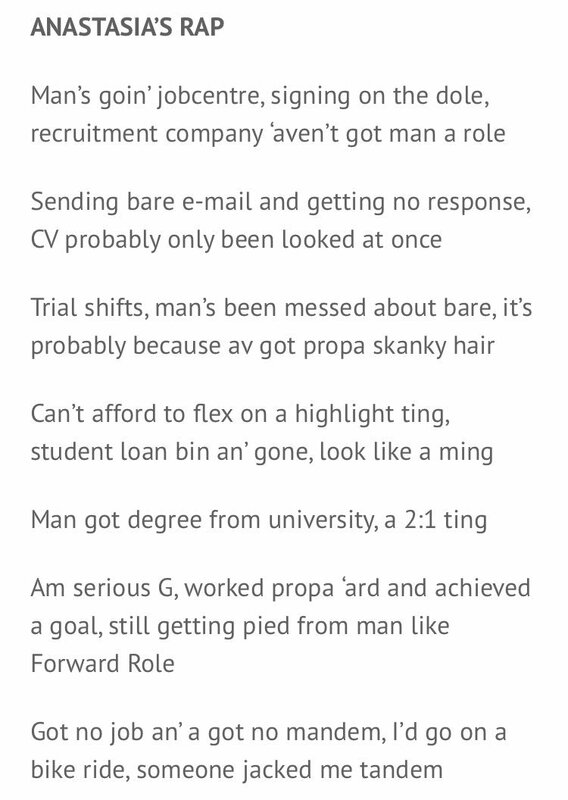 A lot of people said the only reason Anastasia’s rap cover letter helped her get the attention of a huge job recruiter is because of her ethnicity, and that the rap wasn’t that good in the first place. Regardless, it ultimately worked. And that’s all that probably matters to this woman who hopes to be gainfully employed. Wieden Kennedy’s flow is undoubtedly good, and he used it to further his marketing career with his awesome pitch to Sprite. While most people were probably sending in standard cover letters with primitive paper and words, Wieden demonstrated his marketing prowess by producing this amazing music video. After uploading it online, the video became a mini-viral sensation. A look at Mr. Kennedy’s Twitter profile indicates the effort he put into the video paid off: you can tell he’s passionate about what he does and people lapped it up. When it comes to passion, it’s hard to top what David Casarez did in order to nab himself a job in Silicon Valley, arguably the most competitive place in the world for anyone who’s trying to work in tech. David left Texas and the “comfortable” jobs he could get in his hometown with a dream of working at a huge firm in the Mecca of technology, but after arriving at Mountain View and applying to tons of jobs for over a year without success, Casarez found himself homeless. Then he lost his van (where he slept) — but David still didn’t give up. Instead, he printed out a bunch of resumes and held up a sign asking not for handouts, but just the ability to work. So maybe if you’re stuck in a rut and want to move forward in your career, try taking some inspiration from these folks. Happy job hunting!